Note from Zach: Huge thanks to Kelvin King for writing this article. Kelvin has a ton of amazing exercise variations like the dead bug exercises he shows below. Be sure to follow him! Little rant: I love dead bugs. However, their relationship to specific sports performance has not been fully tapped into. No matter age, sport or form used, the dead bug and its advanced applications should encourage all to fall in line with current advancements in the training arena to build a better body and improve athletic performance. The goal of the Strength and Conditioning professional should be to build a multifaceted approach to the dead bug from the ground up, making it a unique staple in our programs respective to each athlete’s body stature, development and sport. The transferable skill of the dead bug under various loads will demand immediate spine protection, core stiffness, strength, in conjunction with endurance of the core musculature providing us with the opportunity to be creative in our thinking, which will change the landscape of athletic performance through topical stress within an organic environment experienced through movement. More importantly, there should be a slow cooker approach to athletic development, it is imperative we teach athletes to absorb force correctly to deal with the multidirectional and multidimensional movements absorbing on a daily basis. The dead bug is great in lending trainers a big hand in developing and maintaining an athletic core through topical and organic means. Through an athletic core, in an open environment the athlete should be allowed to make mistakes and interact with a tricky, unpredictable environment so it is up to the professional to program, which variation is best for your client. That being said, several of the advanced exercises below will change the way you look at the dead bug. Although advanced, below are several dead bug variations you must include in your training program. For those who need to stick with the basic dead bug variations, please do so. For those athletes who find themselves sitting in the car, on the bus, in conferences or the film room, many of those hours are spent hunched over. This prolonged forward flexed posture can lead to inadequate thoracic spine mobility limiting ability to get into athletic positions. These dead bug variations will remove the rolling back and forth on a foam roller allowing pressure to be applied in places where it is needed most. More importantly, these dead bug variation also challenge the strength and stability of the core with an added benefit maintaining good hip and shoulder mobility. This dead bug is tricky because of the rigid foot and ankle alignment to keep the foam roller locked in; in addition, your core must remain tight with mental focus. Movements on the foam roller in this and other capacities, challenges the stability and motor control throughout the lower body demanding intricate muscles of the core to be utilized. In all, this supports the dead bug variation because the number one goal is to keep the entire core musculature dialed for effective movement. I stole this Chaos Band (Chinese Plank) setup from Dr. Joel Seedman who continues to keep every professional and athlete at the top of his or her game. This dead bug variation, demands core stabilization, strength and endurance. This variation also demands glute activation, leg strength, hip mobility, spinal stabilization and balance. This dead bug sprinter variation can help solidify the technical aspect of sprinting, reinforcing the posture needed to be in the right position and being able to apply force preparing for the integrated movement of sprinting. An athlete’s speed is determined by stride length, stride frequency and force production when applied into the ground. More importantly, what is not noticed in this progression is the ankle mobility that will help an athlete dorsiflex their ankle maximizing their foot contact into the ground. The yoga block or foam roller forces the athlete to keep the toes pulled up toward shins with feet activated into the block as in the ground, knees are up and at the flexed position keeping shins behind knees, glutes and hamstrings are activated. With this dead bug variation, we get good core control, posterior pelvic tilt, hip flexion and hip extension. If you do not have a yoga block, use a small foam roller. This Isometric Hip Extension with the Dead bug protocol demands core control/endurance/balance/and adequate motor control while there is simultaneously an eccentric/concentric action on the opposite leg. Although this variation test the above, it also strengthens the glutes, encourages leg abduction and the dynamic forces of the lower in conjunction with the upper body to resist rotation. This variation like the dynamic movements of one’s sport activates the anterior and posterior chain with testing one’s Tri-planar hip stability and motor control. Furthermore, posterior chain engagement is encouraged for adequate hip extension to perform explosive and dynamic movements. The colorful approach of this exercise also demands spine/abdominal control and stability with adequate hip musculature for endurance and balance, in addition to learn and control the body through explosive movements. Inverted rows is nothing new. Additionally, they are a great way to build the back musculature and keep the alignment of your body intact, more importantly a great test to make sure the hidden gems of your body are working correctly. With an isometric hold in this position or with an inverted row it is forcing your body to engage specific muscles groups throughout your body whether you’re pulling or performing a hold. Implementing the dead bug protocol here increases the demand on the core/trunk musculature challenging core strength, core endurance, along with glute/hamstring strength and endurance, which will aid in you successfully performing the movement. With this single arm iso hold, there are specific rotational mechanisms that must be overcome because performing the dead bug protocol in this state will take you out of position. Now some of you coaches will not appreciate this because you are asking, well has not the dead bug been done before, are not there more or advanced seminars being done on simplifying the dead bug and or why is it being progressed to this extent. The answer is because we have kept the dead bug in a clinical setting at seminars when you present it, 50 percent of your clientele that pay for the seminar goes back into their bad habits performing the same movements learned but not progressing. 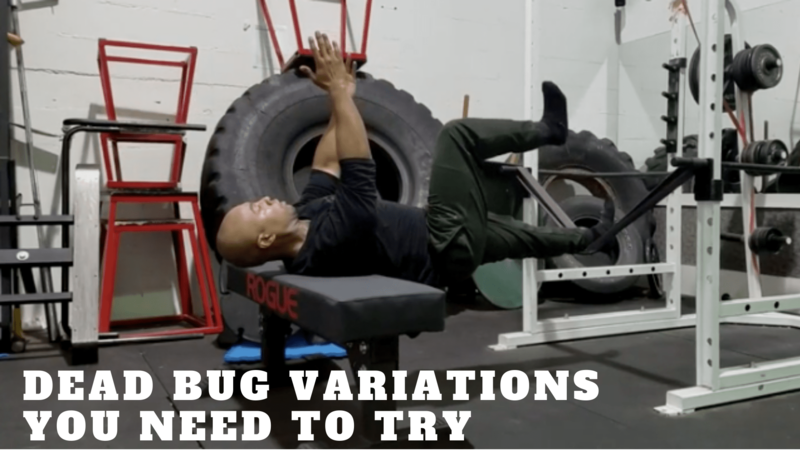 There will be a time when you will want to perform some different dead bug variations and what better way to hit your core and advance your training program, in addition to increase performance than perform these variations. Bio: Kelvin King, Jr is the owner of Creative Athletic Movements, and serves as a High School Strength and Conditioning coach and consultant. Kelvin is a highly sought after strength and conditioning expert and writer who works with athletes in the Washington, DC area.